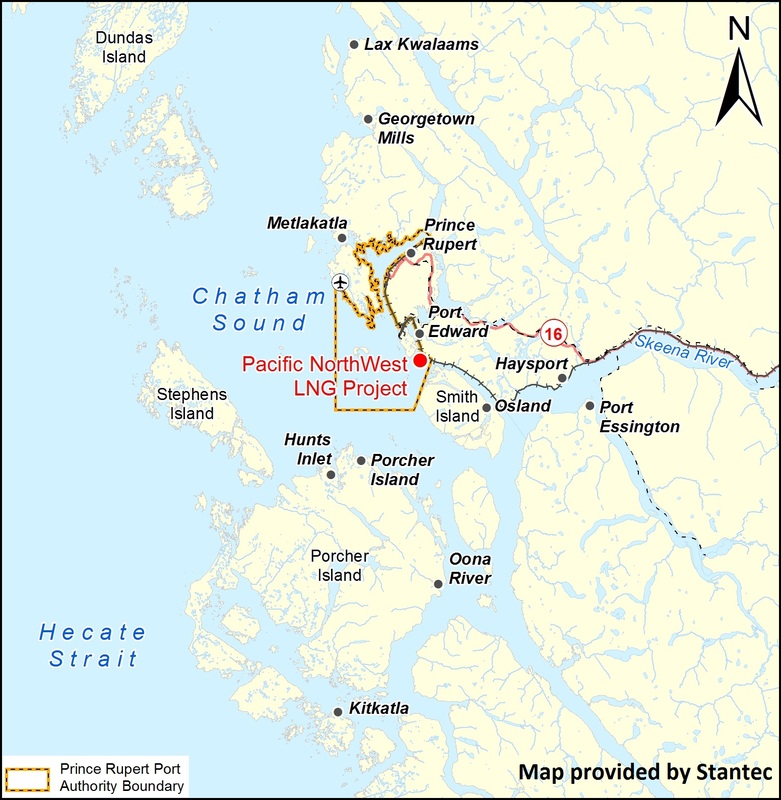 Map courtesy of Pacific NorthWest LNG Limited. Pacific NorthWest LNG Limited has received approval from the Canadian Government to construct and operate a new facility for the liquefaction, storage, and export of liquefied natural gas in British Columbia, Canada. The Pacific NorthWest LNG Project will be located on federal lands and waters administered by the Prince Rupert Port Authority approximately 9 miles (15 km) south of Prince Rupert, British Columbia. At full production, the facility will receive approximately 3.1 Bcfd (9.1 x 107 m3/d) of pipeline grade natural gas and produce up to 22.5 million tons (20.5 million tonnes) per annum of liquefied natural gas for over 30 years. The project also includes the construction, operation, and decommissioning of a marine terminal for loading liquefied natural gas on to vessels for export. The project represents one of Canada’s largest resource development projects with a total capital investment of up to $36 billion when accounting for upstream natural gas development. During construction, the project will create an estimated 4500 jobs and an additional 630 direct and indirect jobs during the operation of the facility. The project calls for two liquefaction plants (LNG trains), two LNG storage tanks, marine berths, a materials offloading facility, and a power plant with aero-derivate gas turbines to provide the compression and non-compression power for the facility. The facility is being designed to include the potential for a third LNG train and third LNG storage tank. When complete, Pacific NorthWest LNG will receive natural gas delivered via the Prince Rupert Gas Transmission (PRGT) project from the North Montney region of northeast British Columbia. TransCanada has been selected to build, own, and operate PRGT. Construction is estimated to take approximately four years.